This picture does not represent the piece too well. It did not pick up the teeth, or the pupil of the eye, and it barely has the nostrils! Well, this business card holder will replaqce the old one at all future craft shows (thats pretty few and far between). 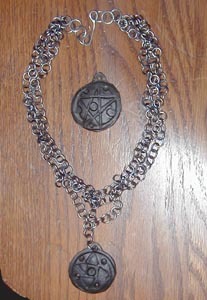 These are two examples of pendants ive been toying with (the chain is braided chains of colored TI). These are hot stamped, sunk into a swage, then hot cut out close to a circle shape, then ground into a more circle-like shape. 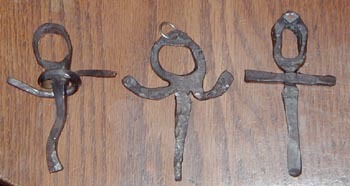 These are my attempts at forging an ankh. Theyre in chronological order from left to right, not pictured are the two of the last type that i broke at the neck. 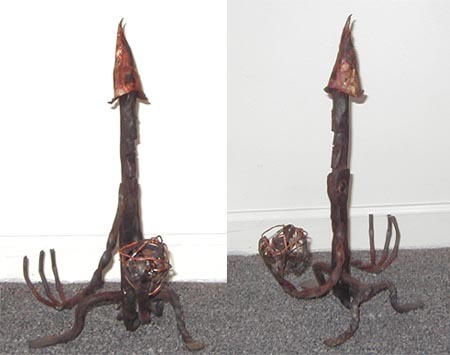 Another forged dragon candle holder. I might sell this guy at an upcoming craft show...or i might give it as a present to someone someday...i havent decided. 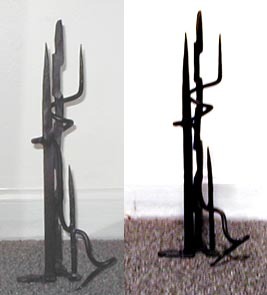 Made from 4 pieces of 1/4" round stock forge welded, twisted, and upset. The bottom was put on with a tenon and the top is copper piping wedged on. This is a creature..i'll leave it at that. All holes were hot punched, all carving was done hot. No power tools were used. Close up of the face is below--pictures, as always, detract a lot from metal work. Sculptures are fun. This one is about 14" high. No power tools were used (except a mig for a few tacks). One of these days im going to get good with a camera so i can get a more realistic representation of my work! 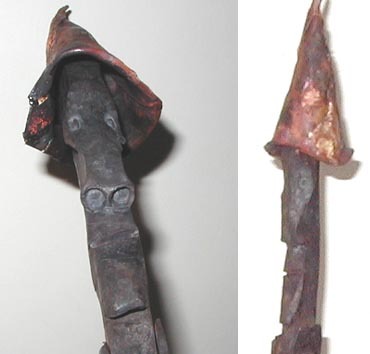 The picture on the right is the piece as a sillhoute...i thought it looked cool so i figured id include it.